Have been watching the Arb cam this morning...looks like some of the chaos has settled down and it is Z3 and an unbanded female who have successfully claimed the territory. However, I am not seeing successful copulation. The male has mounted her back but she did not lift her tail enough so the attempt failed. Sometimes a female who is too young to breed will behave this way. But sometimes a hungry female will also behave this way! Part of the courtship! We will see if eggs are laid or not. Many nests are incubating now. Several people have asked why the birds are still copulating after they have already started incubating. Ospreys begin incubating as soon as they lay the first egg. They continue to copulate to fertilize subsequent eggs. Eggs take about 72 hours to be formed, fertilized and pushed out, so they lay the eggs about one to three days apart. (They typically lay 2-3 eggs. Occasionally there are four.) The chicks will also hatch one to three days apart, so one chick may be as much as six days older than the youngest. This gives that first chick a head start and a distinct advantage when competing for food. Alan Poole, who wrote the well known book "Ospreys, a Natural and Unnatural History" says the youngest chick can weight 25-30% less than its older nest mates. This is called asynchronous hatching. Ducks, on the other hand, do not begin incubating until all eggs have been laid, and then all chicks hatch at the same time. This is called synchronous hatching. We do see runts on Osprey nests with clear differences in size in the early days, and some of them do not survive, but in some cases, by fledging time they have caught up, and it's hard to tell which chick is the youngest! I watched a female lay an egg yesterday. She was upright on the nest edge when I arrived. I was hoping to read bands on both birds so stayed and watched for several hours. During that time she did not leave the nest but moved into the center of the nest and assumed a hunched over position. She began rocking back and forth slightly, as if she was shifting her weight from one foot to the other and she repeatedly looked down between her legs. After about 20- 30 minutes of this she began poking around in the nest cup and finally sat down in incubating posture! Then the male came with a fish and she stood up and they both looked into the nest cup, and then he assumed incubating posture! Chicks are on the way! Some news about our friend Mr 79, who has nested on the arboretum cam nest for years. He disappeared from that nest last Monday. Today I was out checking nests and saw an osprey sitting on the side of the road...it was 79. I approached with a towel in hopes of capturing him but he flew off. He flew fine, wings are fine. He kept landing on mailboxes, garbage cans etc...and everytime I tried to get close he flew. He finally made some loops and got higher in the air and soared off over Lake Minnetonka and I lost him. I do not think he is doing well, but he is fully flighted so he can't be caught. Maybe this is the way old birds fail. I hope he is just having a bad day. Somehow he wanted me to find him I think. Send him good thoughts...and let me know if you see him. Thanks to all the people who tried to help, bringing boxes, taking photos of his band. I feel sad. I want him to be OK. So many little dramas going on...I thought this one might make you chuckle, as it did me. A pair of Ospreys built a nest on a large radio tower last year...the company tore the nest down this winter. (You are supposed to have a permit from the state to do this). The birds started rebuilding, so the company went back up there and removed the sticks again and put a fake owl there. Now the Ospreys have a nest halfway built, incorporating the owl! HA HA. People think these birds are stupid...they do know the difference between a real owl and a plastic one. And they can be stubborn! I am happy to report that our old friend Mr 79 is back on the cam nest at the Arboretum. I saw him last evening but wanted to confirm the band in better light. He has set a new longevity record at 23 years of age. He seems very hungry and his mate, 3S was being a little aggressive towards him for not sharing. That will change. I think she has been quite stressed having to defend this territory alone and now 79 will chase away those males and things will be easier for her. Welcome back 79! It's been quite a crazy few days. I could write volumes but will have to condense it here. After several days of field work, a car breakdown (check engine light on) and an expensive repair, many nests have been visited...and some I still haven't gotten to for the first time. Lots of bands have been read, still many more to read. I like to get as many read before incubation as possible since once they start sitting, you can wait a looooooooong time to see legs. But with so many nests, it's just not possible to read them all during this short window before eggs are laid. I keep plugging away at it. I always say, read bands early and read them often. SO much is revealed by the changes in banded birds on a nest and by who is copulating with whom and who is visiting who! The wood ticks are out...oh my. And we do have our first eggs laid! I have seen some of my old friends and sadly, some seem to have not survived migration. Our oldest male this year is our 22 year old and he has been waiting for his old partner for weeks. He connected with a few other females during that time, even ones that belonged on other nests. We were about to give up, and then his long time mate finally showed up! This marks their 14th year together!!! Fantastic. Break out the champagne! I have seen a great deal of chaos at a variety of nests, with too many Ospreys flying around. I observed a nest yesterday with two males doing elaborate and very vocal sky dances to impress the lady on the nest. I have watched many nests where a third osprey tried to land on the nest only to be chest butted off, or snapped at. At some other nests I have identified the same two Ospreys meditating in perfect peace as they restore their energies and prepare for what's to come. We have one nest that was taken over by....geese. There are some nests where I still have only seen a single bird, and too many nests that were removed, probably without permits. I have barely begun to put a dent in the work ahead. Much of it is a pleasure, some of it is frustrating. Waiting for two hours for a female to show me her leg bands...and getting no info! AHHHHH. I have to say once again, all my years of work and talking to people have created an amazing network of informants. So many wonderful people drop me a note with some valuable tidbit...so many regular committed volunteer monitors have been exchanging emails, full of conversations about behaviors, observations, questions. So many new volunteers this year are diving in whole hog, buying scopes, visiting their nests several times a week. Wow! And my experienced volunteers are so deeply valued, with all their knowledge about behaviors, band reading and what we call "fanatical patience"...a term stolen from my meditation teacher. It's required to do this work of collecting data and reading bands. Since it is National Volunteer Appreciation week, I extend a deep and heartfelt thanks to all of you who help me watch over these nests. Your efforts are so valued. I am sure more birds will lay eggs soon, and new nests will begin to pop up. Please report any observations of Ospreys carrying sticks, building nests or just hanging out in a new spot. And a special thanks to Clarence and Gladys Osprey, who sent me a gas gift card today. I will be using it to come visit you very soon! So glad you made it back! Well,well,well, For those who like a little soap opera action, the male on the Arbortum cam this morning (the day after the post below) is Z3...yes, it's Z2's brother, who was on the nest yesterday. I have screen shots of both bands. Both males have brought a fish for 3S too so we will see how the game of musical nests ends. Stay tuned! This fellow is working on the nest, digging a cup for the eggs, tho I have not seen a successful copulation yet. We finally have a pair back on the nest at the Arboretum with the live cam. The female is the same one as last year, 3S. She is 5 years old this year. The male from past years, 79, has not been seen. He would be 23 years old this year if he returns. 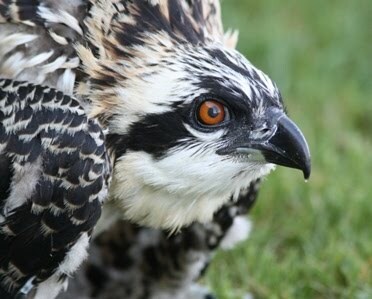 The oldest banded osprey documented in this study so far has been 22 years old. 79 has always been a late return in the spring so it's possible he may still show up. Meanwhile, another new young male has shown up. He is Z2, a three year old. He has been bringing 3S fish so perhaps he will be her new mate. Time will tell. As I predicted, the southerly winds have brought a boatload of Ospreys into town. Holy smokes. I was out all day trying to read bands and see what's happening. Some drama at some nests, with 5-6 Ospreys flying at onetime...territorial battles...and some birds on the wrong nests, some new mates. We will see what happens when the music stops and everyone has to sit. The wind gusting at 38 mph made band reading difficult ...the scope jiggling like crazy and birds having trouble hanging on to the nest and their fish. One female dropped her fish while trying to battle her way back to her nest. I watched one male land on his nest where a female was waiting...tho not his female of past years. He had a fish and she wanted it, but he was acting defensive, as I described in an earlier post. He was hanging his head, back turned to her, shaking his wings...and she kept jumping at him. Trying to scare him off? She finally bumped him off the nest. Ain't gonna get the fish that way honey. I was laughing out loud as I observed this little drama. He came back with the fish and she did it again, all the while food begging very loudly. Funny. Don't know how that one ended! Time will tell. Some nests are occupied by the regulars and things seem peaceful. I have a lot of bands to read and many more nests to visit. 125 miles today and 20 nests. I ran into one of my new volunteers out there today...great to have a face to go with the name. It's wonderful to meet the people who share this interest and passion. Thanks to you all for helping me watch over these nests! Seems like the Ospreys are starting to arrive in the metro now in greater numbers. I visited 19 nests and found birds on seven of them. I have read about nine bands so far. And one male had his band read twice today on two different nests (as I did last Sunday also). I watched some drama at one nest with two Bald Eagles and two Ospreys chasing each other around. This is not uncommon this time of year, but always interesting to watch how aggressive the Ospreys can be when they feel threatened. Always interesting to hear that vocalization that means "oh no a Bald Eagle". Some males were working hard on the nest, bringing sticks endlessly, digging a cup for the eggs, some are still looking around for a female, doing the courtship dance in the sky with a fish. Some pairs are clearly old mated pairs, so comfortable together...but some show behaviors that indicate it might be a new partner. Males can become defensive, turning their back to a female, hanging their heads and sometimes spreading their wings a little bit and shaking them. The females seem to hold some power...is he good enough for me? There are just so many fascinating behaviors to observe! Another interesting day in the field...checked 17 nests. Three were occupied. Interesting part was that a male that was on one nest in the morning, was at a different nest by the afternoon! He had been displaced by the territorial male who must have just returned today. That sent the other male back to his nest of previous years where he was trying to make up with his old mate by copulating constantly! These early days are SOOOOOOO interesting. As I mentioned in an earlier post, when someone needs to be sent packing, it can happen quickly! I had to do some driving back and forth and reading and re reading bands to be sure what was happening, but things appear settled now...everyone is with their former mates on their territorial nests. I am sure I will encounter this elsewhere too. Of course this does raise some questions about paternity! Today I visited about 20 nests and found only two of them occupied. Tho one of the females was not on the nest she occupied last year! This time of year it is always like musical nests and I love to document all the movement. Many sources say they mate for life, but I have seen a lot of "divorces" , mate swapping, nest swapping, in my 22 years of studying these magnificent birds. Some Ospreys do seem to have long term relationships with a partner, but many have a series of different partners, sometimes due to death, but also due to a pair splitting up. They seem to split after a failed breeding season, so it makes sense that a new nest and a new partner might provide a better chance at reproductive success. Well today I visited 15 nests and found two occupied. These early days can be so fascinating. It's often a case of musical nests and I am always surprised by something! Today was no exception. I drove up to one nest that had two Ospreys on it, both banded, which is what I expected based upon past years. I put up the scope to identify them...the female was the same one who has been there for several years, but it was a new male. What was most surprising was that he was ten years old, but I had never seen him before! Or at least he was not a regular occupant of a nest I know about. I even read his silver USFWS band to be sure about his identity. I will have to search thru my records to see if I have spotted him before somewhere. This makes me wonder if there are nests we don't know about. I do hope people will report new nests to us so we can do as accurate a study as possible on this population of Ospreys. Now this does not mean he will remain at this nest. If the other male comes back, he can displace this male fairly easily. Yes, sometimes we see a fight, but if both regular resident Ospreys agree that this guy has got to go...they make it happen. We don't fully understand all the behavioral clues that cause a bird to move on, but I have seen it happen often. Having said that, she was allowing copulation to occur...some females won't if it's not their regular, preferred mate. On the other hand, she needs to get her eggs fertilized! He was perching right next to her, guarding her, and trying to copulate frequently. Interesting. Always something fun to observe! A few other reports are trickling in about Osprey sightings! Here we go!